There's lots and lots of ages-old architecture in Amsterdam. 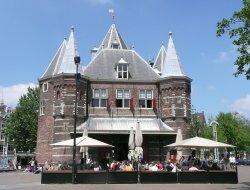 The oldest historic buildings in Amsterdam (e.g. the Old Church) date back to the 13th century. A stroll through the old city centre can be the equivalent of an introductory lesson to Dutch architecture. In Amsterdam, each century has left its unique hallmark on the city landscape. Amsterdam may be famous for its "signature buildings" - the colorful 17th century merchants' mansions along the canals - but its range of architecture is actually much broader. This page covers the 13th to the 17th century. 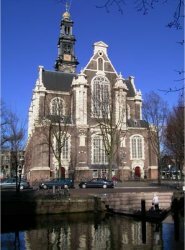 For architecture in Amsterdam from the last 3 centuries, please see our other page about Amsterdam architecture. As a consequence of the two Great Fires that have destroyed major parts of the city in 1421 and 1452, only a small part of Amsterdam's medieval architecture has survived till today. Among those, the majority are stone built edifices. Following the 1452 destructive blaze, the authorities prohibited the use of wood as a material in constructions. However, in the old centre at Begijnhof 34, we can find the Houten Huis, the oldest wooden house dating from around 1420. The Begijnhof complex itself dates from 1346 and was home to the Begijntjes, a community of Catholic sisters. Its small square is dominated by the English Church (Engelse Kerk), built in the 15th century. 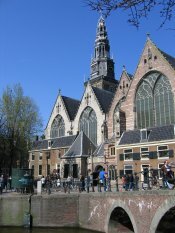 The oldest remaining building of the city is the Oude Kerk (Old Church). Located in the heart of the Wallen quarter (today's Red Light District), the Old Church was built around 1250 as a Catholic church. Since its inauguration in 1306 by the Bishop of Utrecht the church has been subject of many extension works, the most radical of them occurring during the Reformation of 1578. Apart from changes in the architecture, the church became Protestant then. Until the 19th century, the church served as the burial place of many famous inhabitants. Next to the Wallen, the Waag, a massive medieval building that dominates the Nieuwmarkt square, is reminiscent of the old city wall for which it served as a gateway. Built in 1488, it houses a restaurant today. It is worthy of a visit because of its hidden attractions, such as the old surgeon's theatre "theatrum anatomicum" on the upper floor. Public dissections were performed here in the 17th century. Most of the 16th century architecture in Amsterdam is located in the vicinity of de Wallen. At Zeedijk 1 - a street lined with pubs and cafés that was originally a part of Amsterdam's fortifications- lays one of the two surviving Amsterdam houses with a wooden facade that was built in the mid-16th century. One of the landmark buildings of Amsterdam outside the tourist circuit is the Montelbaanstoren. The stone section of the tower was erected in 1512 and for protection purposes. The timber top was added in 1606 by Hendrick de Keyser. During the Dutch Golden Age, the Montelbaanstoren was the meeting place for sailors that would embark on the ships bound to sail to the East Indies. 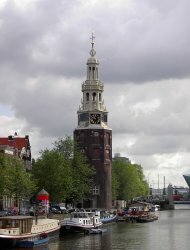 The tower is not open for public but it hosts the offices of the Amsterdam water authority. The epitome of Dutch Golden Age architecture is represented by the rows of gabled houses lined along the three main canals of the grachtengordel (circle of canals): Herengracht, Prinsengracht and Keizersgracht. In the 17th century, these houses belonged to rich Amsterdam merchants. Today, they are offices of banks and cultural organizations, as well as homes of the well-to-do. 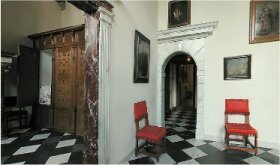 The clandestine Catholic Chapel at the Begijnhof, completed in 1680, is a representative testimony of Amsterdam's religious life as it is the place where Catholic worshipers gathered in secret before 1795 when religious tolerance was fully introduced in the city. It can be visited, but to keep noise at a minimum no tour groups are allowed. 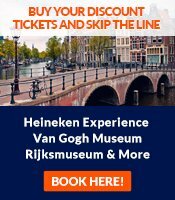 Missing items in this overview of architecture in Amsterdam? Please contact us.